Back in June, Nat Sherman Cigars closed the doors of its midtown store on 5th Avenue and 42nd Street, in the heart of New York City. It was moving to its new store only a hundred or so feet away on 42nd Street between 5th Avenue and Madison, but that’s easier said than done. Nat Sherman’s stock of 800,000 cigars moved to storage in North Carolina, where they waited for the new store to open. Eventually, on October 8, Joel Sherman cut the ribbon opening the new three-story space. Over the Thanksgiving holiday I was able to visit the new space myself and sample some of the company’s famous cigars. Upon entering the store – which still has construction scaffolding covering Nat Sherman’s iconic clock – one notices the spacious 30 foot ceilings rimmed by a balcony and surrounded by decorative doors (below). Upstairs is Joel Sherman’s personal office and a conference room. The main room features four areas of approximately equal size for pipe tobacco, premium cigarettes, smoking accessories and, of course, cigars. 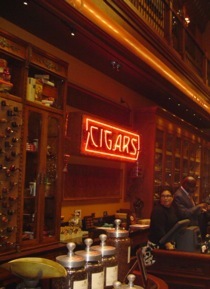 Above the main cash register is the same neon cigar sign (right) that was in the old Nat Sherman store on 5th Avenue. 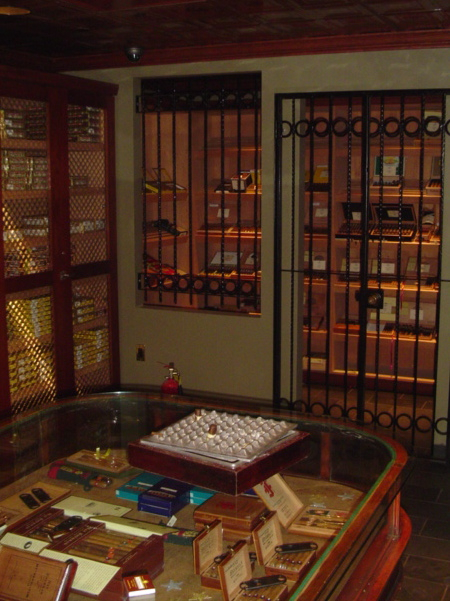 In the back of the store, next to cigar orders from John Wayne, Frank Sinatra, and other world-famous stogie smokers, is a large walk-in humidor (pictured below), complete with personal lockers and an off-limits area in the back for the most expensive sticks. Downstairs is the future home of the the new Nat Sherman cigar lounge. The manager tells me they hope it will be open by mid-December, and that Joel Sherman will make certain that it will be a fantastic space. As is increasingly the norm, the lounge will be members only, with a limited number dues-paying spots available. Overall, it is a small oasis for cigar smokers in a city that is increasingly unfriendly to cigars. 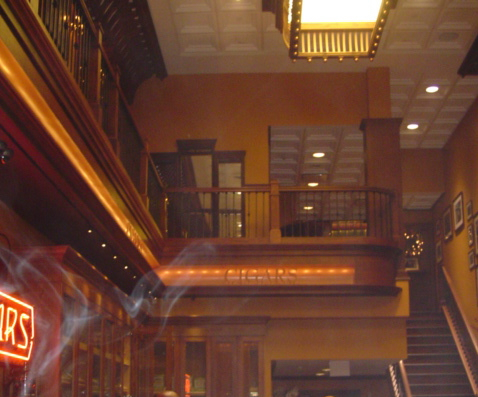 When the cigar lounge opens and the remaining construction is complete, Nat Sherman Cigars will once again be a must see for cigar smokers visiting the Big Apple. Do you know if you have to be a member to smoke inside the store? I've seen people smoking in there before. I'm sure membership fees will be through the roof. I'm trying to find a place to enjoy a cigar in the winter. Anyone is welcome to buy a cigar and smoke it in the shop. It is only the posh cigar lounge that is members-only. Matt, I do not know where you live by NYC, but most of your regular cigar stores in the surrounding boroughs, and especially Long Island, you can smoke in and they have smoking rooms for free. If worst comes to worst a portable heater in the garage is better than nothing. Where around queens/long island are you finding cigar friendly bars? The only one I found is Havana Dreams on Woodhaven and 63rd in Rego Park. How do I get info on opening a Cigar lounge on Staten Island, NY. Can it work? Maybe if it is a members-only, can I serve drinks? How can I find out if Staten Islanders need a place like this. Anyone is welcome into our store and allowed to come and enjoy a cigar with us. Although our Johnson Club Room is a members lounge, we do consider Saturdays an "open day" and we also have chairs set up in our walk-in humidor now for customer use. Come by and light up around the most smoke-friendly crowd in NYC!